The community consists of posts associated with different discussion topics. A post might be anything, including questions, tips, or feature requests. You can edit, move, or delete community posts, as well as edit or delete comments on community posts. You can also close a post for comment, mark an official comment, promote a post, set status on a post, and create a ticket from a post or comment. Note: The user interface described in this article is based on the default Copenhagen theme. If your theme is customized, options might appear differently or be missing. Only Guide Managers can manage community posts. Regular agents don't have the permissions to make any of these changes. The community is available on Guide Professional and Enterprise. 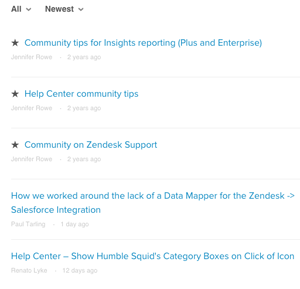 For information about managing the discussion topics that contain community posts, see Managing Help Center community discussion topics. You can edit or delete community posts as needed. In the post you want to edit, click the Post actions icon ( ), then select Edit. Make your changes, then click Update. In the post you want to delete, click the Post actions icon ( ), then select Delete. The post is removed from the topic and cannot be recovered. You can edit or delete comments on community posts as needed. You can also mark an official comment (see Marking an official comment for a post). Beside the comment you want to edit, click the options menu, then select Edit. Make changes, then click Update. Beside the comment you want to delete, click the Comment actions icon ( ), then select Delete. The comment is removed from the post and cannot be recovered. You can move a post from one discussion topic to another in your community. You cannot move a community post to the knowledge base. In the post you want to move, click the Post actions icon ( ), then selectEdit. Click inside the Topics box and select another topic. You can promote community posts by pinning or featuring. When you pin a post, it moves to the top of the posts list within its topic and has a star beside it. This enables you to draw attention to important posts in a topic, such announcements or guidelines. Pinned posts always appear at the top of the topic, regardless of any sorting option chosen. The most recently pinned post will be the top-most. You need to manually add styling for pinned posts so that they appear different than other posts in the topic. When you feature a post, it appears in the featured posts component, which you can add to any page in your theme. In the post you want to pin, click the Post actions icon ( ), then select Pin to top. If you don't want the post to be pinned to the top of the topic anymore, select Unpin from top. In Guide, click the Customize design ( ) icon in the sidebar. In the Theme panel, click Edit theme. 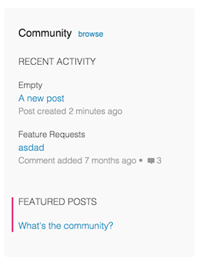 Select the Community post page in the template drop-down in the upper-left. Click Save, then Publish changes. In the post you want to feature, click the Post actions icon ( ), then select Feature post. You must have added the featured posts component to your theme for the post to be featured. Otherwise, selecting the feature post option does nothing. If you don't want the post featured in the Featured Posts component anymore, select Unfeature post. Select a template from the template drop-down in the upper-left, then paste the following snippet of code where you want featured posts to appear (on your Home page, for example). Click Preview at the top to ensure it looks as intended. To preview a featured post, use the preview window to the right of the theme editor, locate a post, click Post actions and click Feature post. You can set a status of Planned, Not planned, and Completed on any community post. This can be especially useful if you have feature requests in your community and want to communicate status. When you set status, the status appears in the list of posts within the topic and on the post itself. You can filter by any status to see all posts in a topic with the selected status. 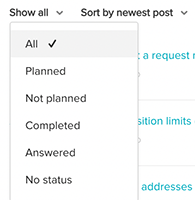 In the post where you want to set status, click the Post actions icon ( ), then select one of the statuses: Planned, Not planned, Completed , and Answered. In a community topic, click Show all, then select one of the status options. If you don't want to allow comments on a community post, you can close the post for comments. In the post you want to close for comments, click the Post actions icon ( ), then select Close for comments. You can mark a comment as the official comment for a community post. You can make either a new comment or an existing comment the official comment. There can be only one official comment on a post. You cannot mark an official comment on a knowledge base article. When you mark an official comment, it appears as the first comment on the post and is indicated as the official comment. That means that if you edit an existing comment and mark it as official, that comment moves from it's current place in the order and time line of comments, and appears at the beginning, ahead of any older comments. In the post where you want an official comment, either enter a new comment or edit an existing comment. Click Official comment under the comment. Click Submit or Update, depending on whether you are making a new comment or editing an existing comment. The comment becomes the first comment on the post and is indicated as the official comment. You can create a ticket from a community post or comment. When you do, a ticket is created in your instance of Zendesk Support with the body text from the post or comment and a link to the post or comment. In the community post, the ticket number link appears at the top of the post so you can easily access the ticket from the post. In a community comment, the ticket number link appears beside the comment. In the post you want to convert to a ticket, click the Post actions icon ( ), then select Create a ticket. Make any changes to the title or body as needed, then select yourself or the poster as the requester of the ticket. If you select the person who made the post as the requester, that person will receive an email notification. Beside the comment you want to convert to a ticket, click the Comment actions icon ( ), then select Create a ticket. Make any changes to the subject or description as needed, then select yourself or the poster as the requester of the ticket. If you select the person who made the comment as the requester, that person will receive an email notification. That will remove the name of the person posting along with the link to their profile, a few line up you could remove the avatar as well. @kristin - here are some screenshots in case you are a visual person. Is there a way to recover posts that were accidently deleted? Hi @Brenda - Sure you can see the following post here. Just let me know if you have any further questions. Haha, I knew it Brenda! And I agree, Wes is the best. We've actually got him busy on our HCs now! Will moving a notification from one discussion topic to another alert users that it was moved? I want to move a lot of posts in our "Product Feedback" topic to a "Question & Answer" topic because it better belongs there. However, I don't want anyone notified of the change. Bottom line, I'd like to try things like change the "PInned" label into a star, move it to the left of the post title, etc. Can you let me know if I'm doing something wrong, or if the instructions just need to be updated? Thanks! Let me know if that helps or if you have any further questions! Hi Nicole. this wasn't exactly what I was looking for...if you look at the Zendesk community home page it includes the topic title and title description. My community only shows the title on my topic list page...how can I make it show the description? It's something that should just work. Do you have any custom code running that could be interfering? No I didn't implement any custom code, I turned the communities on, and it's always looked like that. I am trying to retire some really old community posts. Is there a way I can see all community posts in "date created" order? Go to your community and click the arrow to the right of "Community Topics," and select "Show all posts." From there, you should get a dropdown that allows you to select "Sort by newest post." Then you'll just have to go to the end of your list to see your oldest post. It's not the most elegant, but it should get the job done. Let us know if you have any additional questions! Is it possible to for end users to post comments to community posts without signing in or even providing an email address? I see that this is your first post - Welcome to the Zendesk Community! I encourage you to head over to the Welcome Thread in The Lounge to introduce yourself. To answer your question, users must log in in order to be able to post or vote. They can, of course create an anonymous account with whatever email address they wish, but the platform does require users to log in to post or vote. Hi, if someone vote in Community topic and makes a comment, where can I see the notification of that? I can't see the option in Guide Main Panel. You will need to subscribe to the topic to receive email notifications of Community activity. As for votes, there is no notification system for those.